The last week has been filled with new processor announcements, mainly for phones, but cameras as well. (yes they run some powerful processors now too). TI is barely shipping products with its dual-core OMAP 4 applications processor and has already announced its successor, the OMAP 5. The OMAP 5 will be a 2GHz dual core ARM Cortex-A15 (the next ARM generation after the A9). It also includes a pair of ARM Cortex-M4 processor. the Cortex-M4 is a 150-300MHz microcontroller oriented processor. This will allow the OMAP 5 to run basic background tasks on the slower (lower power) cores while reserving the high power cores for tasks that actually need them, increasing battery life. Samsung decided to rename the Orion processor (announced back in November) to the Exynos 4210. A bit of a mouthful compared to Orion. Qualcomm showed off the APQ8060 in HP’s new TouchPad. 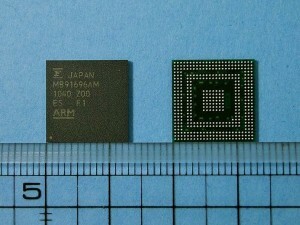 This is a dual core version Snapdragon processor we have become very familiar with. Qualcomm has an architecture license from ARM so they are free to design their own cores without having to stick to ARMs own implementations (such as Cortex-A9 etc). This gives Qualcomm more flexibility to design in features they need, and tweak design more best efficiency. Smart phones aren’t the only ones getting new processors. Digital cameras now require immense amount of processing power (especially to handle 1080p video recording. Fujitsu (yah, they still make a lot of processors) announced the Milbeaut MB91696AM. This is a dual core ARM processor with many other DSP functions capable of handling 14Mpixel shooting at 8fps, as well as full HD video. A lot of talk goes on about ARM cores and their increasing use and speed. While the market penetration, shear speed, and low power of ARM cored devices is certainly amazing its important to not forget that their are other cores in wide use as well, if not as glamorous. The MIPS architecture was developed at around the same time as ARM (1985) and actually enjoyed success in the market much sooner then ARM did. MIPS continues to be widely used in embedded applications (expecially the MIPS 4000 architecture). Broadcom is one of the largest users and producers of MIPS cores devices. Broadcom recently announced the BRCM5000 MIPSs CPU core. It can issue 2 instructions per cycle and at 40nm runs at at least 1.3GHz (worst case speed). It should handily clock to 2GHz+ given good process and part selection (the core uses AVS to scale voltage internally to find the perfect voltage/speed combination on a part level basis). Broadcom chose to not use a multi-core design as a multi-core doubles die area, almost doubles power, but in typical applications does not double performance. Using a dual-threaded design, on a dual-issue core, does provide almost a doubling of performance, at a minimum of die area. Die area being a huge concern when the core must be integrated into various products used for mobile devices. The BRCM5000’s predecessor (the BRCM3000) occupies a mere 1 square mm of die space at 40nm. 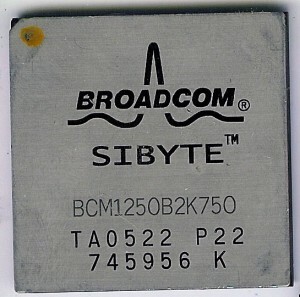 Broadcom is not new to the MIPS seen, they have been using them since the 1990’s when Broadcom was founded. Since then they have continually enhanced their products, via internal development, as well as many acquisitions. 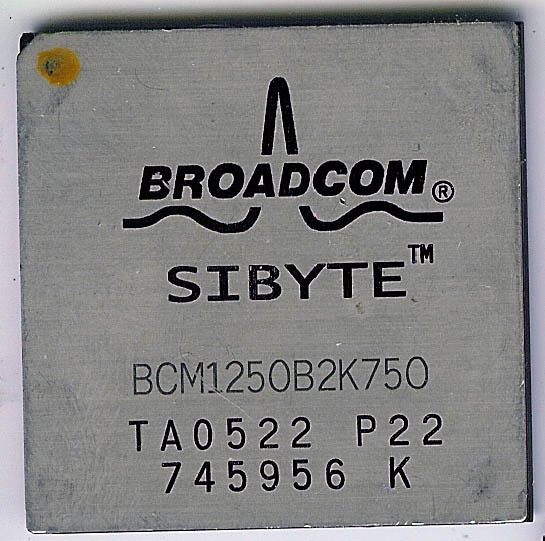 Some of the more notable MIPS acquisitions were Sibyte in 2000 who made high-end MIPS network processors and the Xilleon product line from ATI/AMD in 2008 which made Digital TV Processor chips based on the MIPS core. Just recently Broadcom closed their purchase of Beceem, a company that makes 4G chipsets based on the MIPS core. MIPS continues to be used not just by Broadcom. Microchip’s PIC32 line is in fact a MIPS R4K processor. Cavium Networks, RMI, Toshiba, NEC, and Sony all continue to use MIPS in a variety of products. MIPS continues to try to penetrate the smartphone industry, and if at all possible should. The competition would help keep new innovations coming.